Check out these photo’s to see how mould can become an issue if you do not attend to your water damage quickly and if your water damage restoration program is not managed by professional certified water damage restoration technicians who know what they are doing. The standard photo of a water damaged building were a professional drying process was not immediately employed shows the beginning of mould growth. 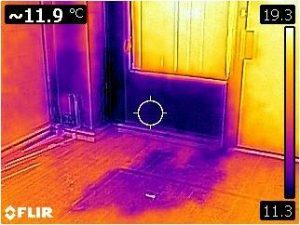 The thermal image clearly shows that there are still wet surfaces and if you look at the photo above you will see that it is in these areas that mould has become a problem. This entry was posted in Water Damage Restoration by admin. Bookmark the permalink. I contaced Jerry on Saturday morning with my flooded warehouse problem and he was able to come and fix it within an hour. Very happy with the prompt water and flood damage restoration service and would recommend Capital Facility Services to others.